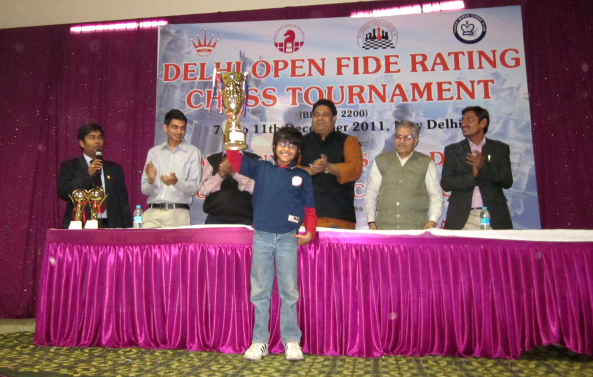 Lifting the Cup!Victory in FIDE U2200. 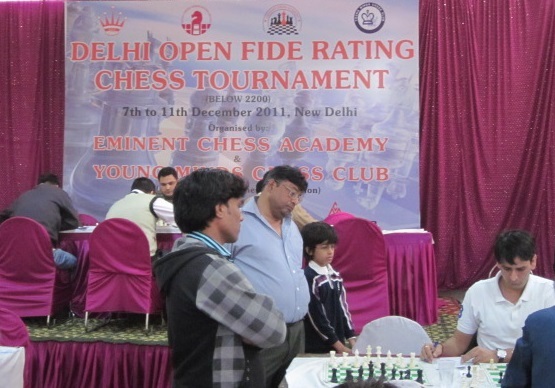 My next tournament after Vizag was in Delhi itself. 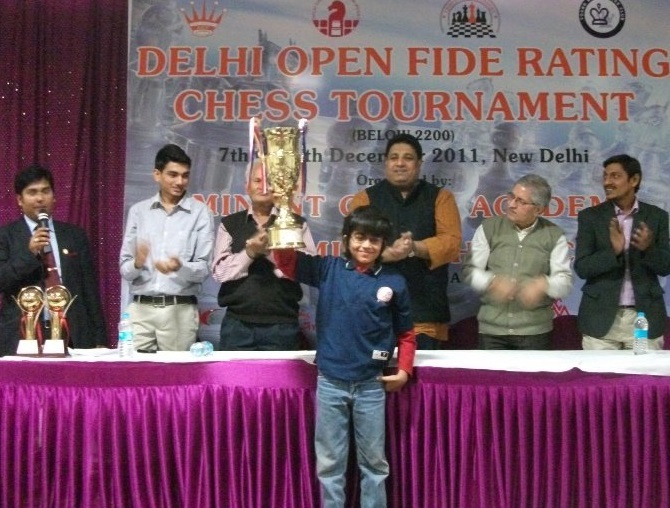 A U2200 Delhi Open Championship from Dec 07 to Dec 12. 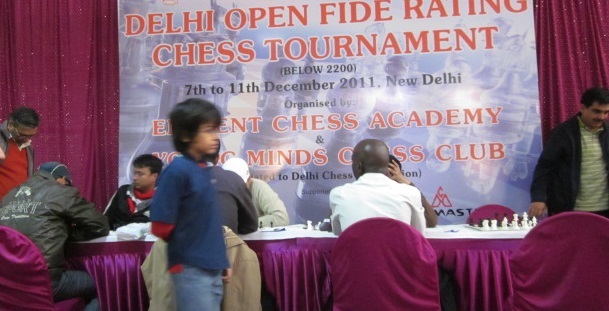 Players from all over India participated and even one from abroad. Coming off a satisfying performance in Vizag GM Open, I had the confidence and eagerness to go out and win the tournament. You can feel it, sense it. I was starting the tournament with a 2012 rating. The first 3 rounds were quite easy (an unrated, a 1365, and a 1661). In the fourth round I was again paired with a lower rated, which was not a surprise due to the majority of lower rated and unrated players. I was playing Black. It should have been a comfortable win based on the rating difference, but the opponent played a conservative Drawish line which made it very difficult for me to win. Needing to win at all costs, I played aggressive chess, countering his passive and defensive play. I captured his Pawns on the King side, and he reciprocated by taking my Pawns on the King side. That left us with a Rook, a Knight, and 4 pawns each. The battle was on. In essence, it was a race – whose Pawn will reach the other end and Queen first. Relying on my endgame skills, I managed to slow down the rate of advancement of his pawns. I was able to draw the opponent out from his comfort zone – the excessive defensive mode – and that is exactly where I wanted him. The opponent realized that the “sit-back” Draw had slipped away and he had to play actively if he wanted to avoid losing. He made a bold decision by advancing his Pawn to b6 (two squares away from the Queening square). I captured a different Pawn, followed by his Knight, which led him to push his pawn further to b7 – now only 1 square from Queening. After some forced checks he made the decisive mistake, which led me to sacrifice my Rook for his Queening Pawn on b7, and pushing my own Queening Pawn to f2 – thereafter it was an inevitable Queening. A very hard win! But I got the job done. The next game I was matched with a player from Uganda! He was higher rated at 2111. It was an uneventful Anti – Marshall and we signed the peace treaty in a drawn endgame. Now after 5 rounds there was only 1 person with a full score and 11 people, including myself following behind with 4.5. The 6th round had me matched with a 2118 rated player. I played Paulsen and he opted for the f4 line. We castled opposite wings and his problem was that he never got his King side attack started. Meanwhile I leisurely continued with normal attacking moves. When just at the cusp of making a decisive breakthrough I erred, perhaps in my haste or lapse of concentration. This allowed the opponent to trade Queens and suddenly my promising attack had vanished. Oh, the gnawing emotions of coming up empty-handed made me re-energize and I came up with another plan. The opponent in order to save the game and play accurately had consumed a lot of time. So now he was getting low on time (5 min) and consequently inaccuracies from his side were inevitable. I pressured his weak Pawn, the only shelter for his King. His inaccuracies began when he moved his King to the A file (corner most file), and the errors kept mounting from there. I opened that file by exchanging my A pawn (pawn on the corner file) with his b2 pawn (his King’s only shelter). He was down to 1 minute and when that happens, your mind nearly locks-down. This time was no exception. I converted the game into a winning point fairly easily after that and went into the following round with a score of 5.5/6. I was now in joint lead with 3 additional players. 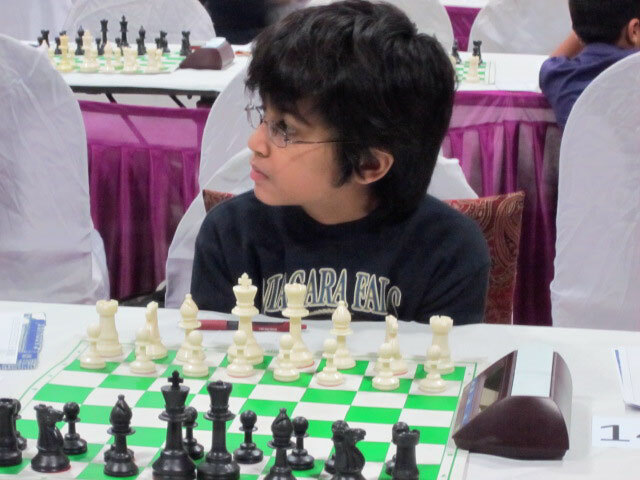 The next round I was paired with a very sharp, dynamic player who was rated at a high 2163. I had to be careful of his clever tricks and traps. He had experience on his side, and had been playing longer than I was born. Well, that was true with quite a few of the higher rated players. The opponent played a Dragon Sicilian, one of the sharpest openings. He offered me a draw on move 15. That was strange. 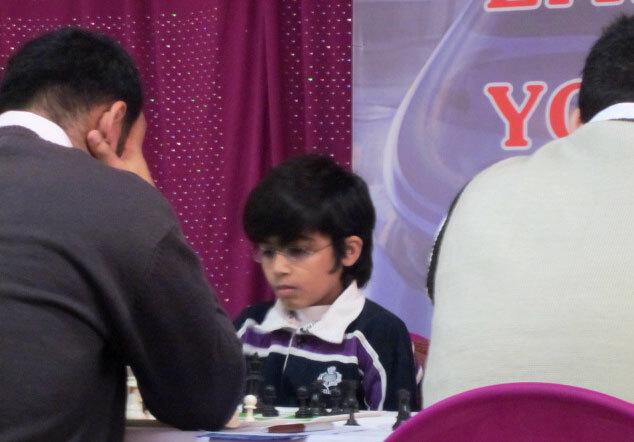 A much higher rated player already offering a Draw, when the game was still young and undecided. I sensed he was unsure. Even though I was tempted to accept his offer since he was higher rated, I also knew that if I took the offer it would break my momentum. A Draw would have me within a group of leading players. A Win could possibly make me breakout from the group. My sense was right. After 15 moves of standard theory, my opponent was out of the books and it was his thinking at the board. He made a dubious move, relying on his intuition that he’ll get sharp counter play to compensate for the material disadvantage. It proved to be a grave mistake as I seized my chance by grabbing the exchange. The only thing left was to consolidate, make sure my King was safe, and convert my material advantage. As I had expected, he started getting desperate for counterplay and he went into a complicated line where I needed to tread extremely cautiously. He made a bold decision when he played e3, but I had seen the winning variation and was able to trade down to fewer pieces. Thereafter, I took the full point without any more problems. I now had the sole lead at this point, which I never relinquished till the end. 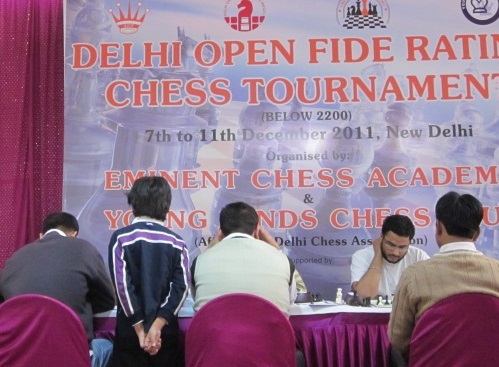 It was the last day, and we had two rounds starting from early in the morning. In the penultimate round I was paired with a player rated 2165. I had lost to him in an earlier tournament. So I was determined to avenge and make amends. As White, he played a reverse King’s Indian. I adopted the setup with g6 which offers Black full equality. I continued with normal development and that’s where he started to play awry. A series of bad moves was followed by a blunder. I latched on to it with Nxc3. The rest was just a matter of technique. I simply traded down into the endgame and won fairly easily. I was so relieved, but I knew there was still a round left. Everything could change in the final round as I had learned many times in the past. It a’int over till the fat lady sings. 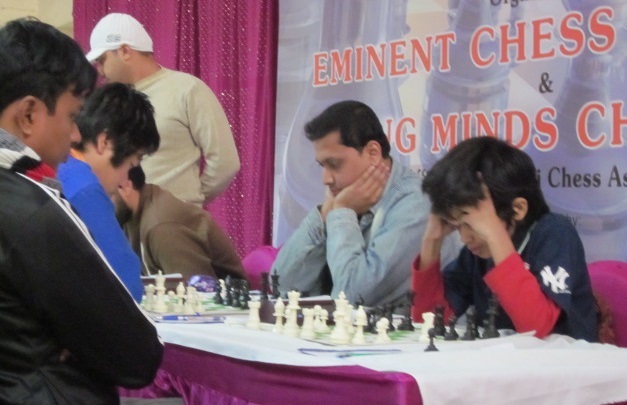 My astute coach advised me to play 15 moves and then offer a draw to see if the opponent wished to play for a Win, or if he was content with a Draw. To win the tournament, I just needed a Draw. I sat down on my seat, determined to be a Champion. Then came the big moment. After 3 moves the opponent offered a draw! Huh?! Just after 3 moves, I thought to myself. Players on many tables are still settling down, and here I’ve a Draw offer from the second seeded player. My heart started pounding. I knew I had won the tournament. I shook his hand confidently and walked off the stage … a Champion. Within two year of being rated, I had won an entire Open tournament. Hard and Smart work pays! I believed it and now I’ve something to show for it. 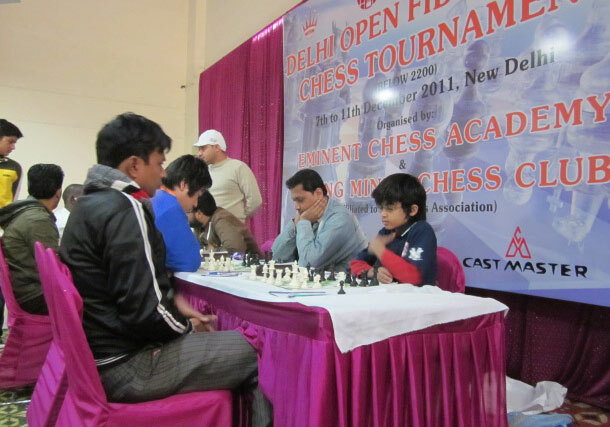 As an aside, when I entered the tournament premises to play the final round I was surrounded by a group of children. They took me to the side and told me to play carefully and win the tournament. They were pleading that always these tournaments are won by adults and never by a child. “This is our chance.” There words were ringing in my ears as I walked to the top table for the final round. Thanks guys for your wishes!